Carrying on with my mission to own a smaller, more manageable collection of beauty products, I recently decided to crack down on my lip products. If you are a long time follower you may remember this post, where I gave myself a talking to. I was on my best behavior for a month or so and then it all went downhill and my collection grew a little more. As I've said before 2013 is the year I make sensible choices with my beauty items and get it all down to a more realistic size for one person! Previously I downsized my nail varnish collection. If you missed that post you can have a read of it here. However today its all about the lip products, here is how I managed to cut down my collection. First I had a look through my lipgloss collection and threw away any that had been there for a long time. All makeup has an expiry date, and those Barry M lipglosses weren't smelling as sweet as they did when I first purchased! In the bin they went. In my opinion, if you cant remember how long you've owned said makeup product, you've probably owned it longer than its expiry date, and it should go! If in doubt, give it a quick sniff, if it doesn't smell right I would just chuck it! 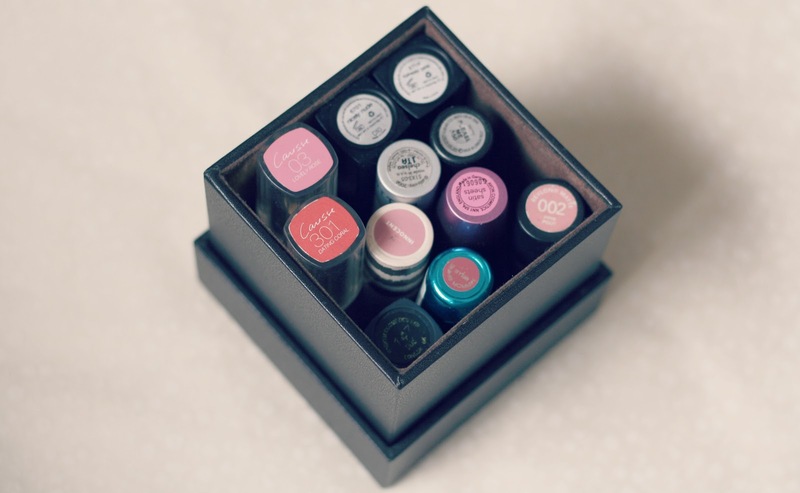 By doing this step I managed to get rid of a lot of lipglosses. My lipgloss collection wasn't that big to start with anyway - I'm not even a massive lipgloss fan! That meant my lipgloss collection was sorted! Moving on and to tackle my lipstick collection, I created 3 separate piles. One for my favourite lipsticks. 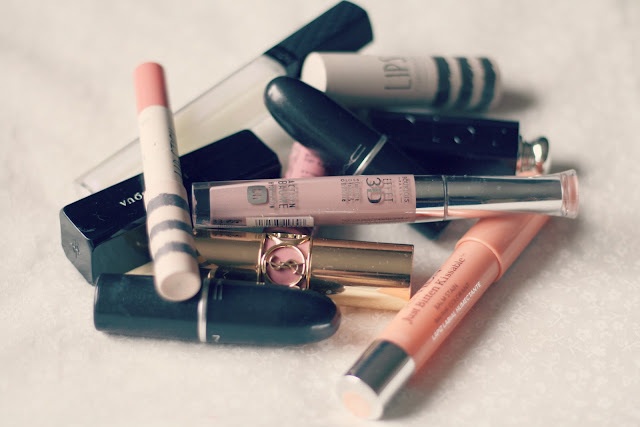 The ones I do reach for when I remember to add lipstick into my morning makeup routine or chuck into my handbag! Obviously these particular lipsticks would be staying in my collection for sure! A second pile for the lipsticks I never wear, Ones I bought on a whim, or shades that I just know don't suit me. With these lipsticks I opted to offer them to my mum, sisters and friends. No beauty lover will turn down free makeup items! My sister took the bulk of these lipsticks, she wears it more often then me! Finally I created a pile of lipsticks that I do like, but I just don't reach for enough. These were automatically put in a separate container to sit near 'getting ready area' in an effort to use them more. If they are directly in front of me and I don't have to go searching for them, I will hopefully start to use them more! Now, I havent put them all with their names facing upwards because of some OCD thing. It's sort of like an experiment. So I want to use these particular lipsticks more regularly in my routine but also attempt to condense down my collection. Therefore my plan is that when I use one of these lipsticks, I will put it back into the container when Im done, the oppsite way around. Meaning they will be sat all snug in there with the lids exposed. If I remember to do this each time I use one of the lipsticks, it will get to the end of the month (or 2) and there will be a high possibility I will still be able to read some of the names of a couple of lipsticks. This will mean that I didnt once touch that lipstick, therefore Its not getting used at all and I don't need it in my collection. I will then offer it to my sister, mum or a friend who will get more use out of it. Make sense? I think this is a tip you could possibly incorporate into other items of makeup in your collection. It depends just how ruthless you want to be! At present I still have more lipsticks than I really need, but I have managed to get rid of a few so far using the steps above and that's a mini achievement for me. Let me know if you've done something similar or are planning to! After all who really needs 50+ lipsticks in their lives? I often downsize and try throw out old make up, I never hang onto anything. Lovely tips, you have super cute shades! !